Win a Free Turducken for Thanksgiving! Thanksgiving is right around the corner and over here at Menuism HQ, we’re already working up our appetites, swapping favorite family recipes and talking serious turkey. And guess what? We’re giving away something delicious in honor of the flat-out, hands-down best holiday for eating. We love Thanksgiving, we love food, and we love you, dear readers. So this year we’re giving away a free turducken from Cajun Grocer (this or a comparable one) to say thanks. That’s right, three birds for the price of none. What are you waiting for? 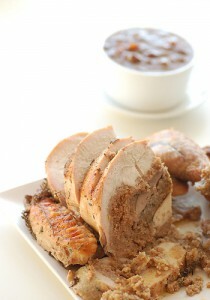 Enter to win our Free Turducken giveaway! It’s free and easy. Here’s the scoop on how to enter the drawing. Contest ends November 19, 2010 at 6pm PST. You must have a US address to be eligible. Winner will be notified by email, Facebook or Twitter by November 20, 2010 at 12pm PST. Winner must claim prize by November 22 at 5pm PST by responding with a valid US address.